Daniel J. Murphy - dmurphy@shawmedia.com Alyssa Oetjens, 11, of Crystal Lake takes a bite of snow while playing with some neighborhood kids after school Friday February 24, 2012 in Crystal Lake. Four to 6 inches of snow fell throughout McHenry county throughout the night, though temperatures are expected to rise this weekend according to the National Weather Service. 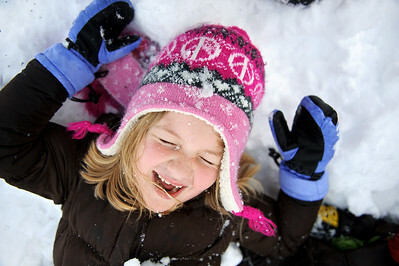 Daniel J. Murphy - dmurphy@shawmedia.com Emily Cooper, 6, of Crystal Lake plays in the snow with some neighborhood kids after school Friday February 24, 2012 in Crystal Lake. Daniel J. Murphy - dmurphy@shawmedia.com Zach Thennes (right) of Madison, WI sleds with his kids Jack, 10, (left) and Julia, 5, (front) at Veteran Acres Park Friday afternoon February 24, 2012 in Crystal Lake. 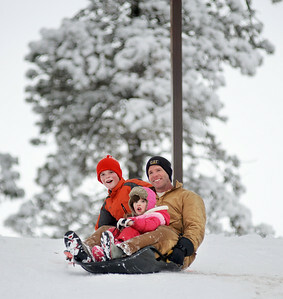 Zach Thennes (right) of Madison, WI sleds with his kids Jack, 10, (left) and Julia, 5, (front) at Veteran Acres Park Friday afternoon February 24, 2012 in Crystal Lake.